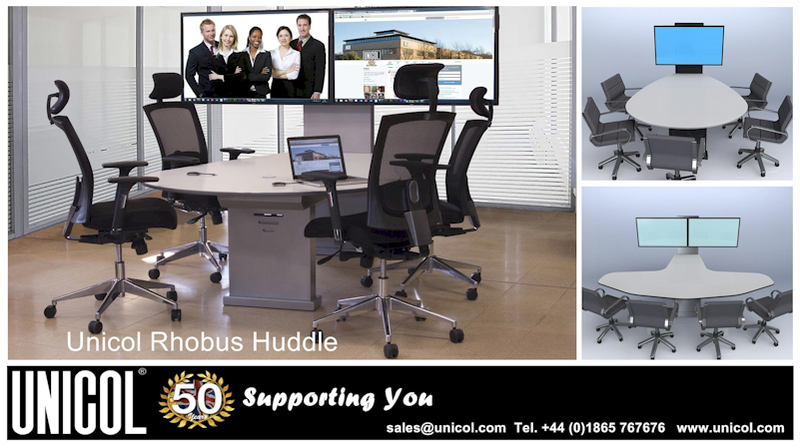 The Unicol Rhobus 2x2 freestanding video wall mount has supporting arms for four display screens and lockable space at the rear for cable management with room for a small signage player. Digital signage presentations showcasing Unicol's new mounting solutions were created on Repeat Signage Media Wall edition software, which allows the same or different presentations to be display on a 4-screen video wall, playing from a Windows PC, we used an Edis mini PC player. The same 4-screen presentations were played onto a 16-screen video wall from a Green Hippo Par4Keet video player, all from 1 Repeat Signage Media Wall software licence. Repeat Signage includes advert templates which allow you to quickly and easily create a presentation by changing the template images and text for your own. Once a number of Repeat Picture adverts had been created and saved, it was a simple matter to create a new presentation and, using the Flash banner control, insert all the Repeat Pictures (.rpic). The fade transition was chosen and timing set to display a new advert every 10 seconds. 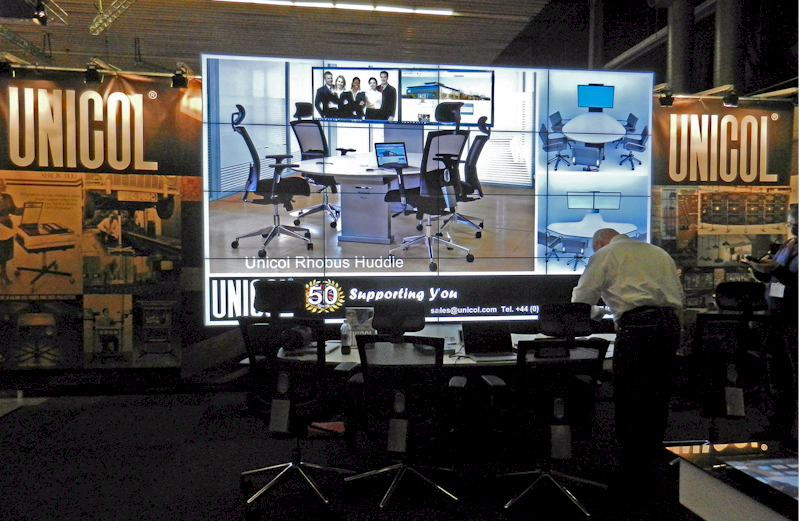 To display Repeat Signage Media wall onto the 4-screen video wall on the Unicol 2x2 Rhobus freestanding mount, the Repeat Signage presentation was saved onto the Edis mini PC which was connected, via HDMI cable, to the first display screen. We connected a keyboard and mouse so we could view the presentation playing on screen. As the four screens were daisy chained together, the presentation played across the whole of the video wall. 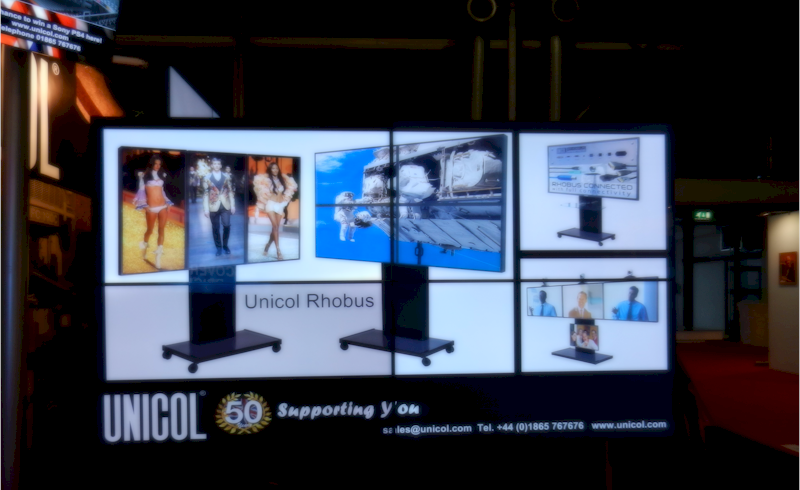 The keyboard and mouse were then disconnected and the Edis player safely locked inside the rear of the Rhobus stand, leaving the presentation playing continuously throughout the three day exhibition, showcasing Unicol’s mounting solutions. Repeat Signage Media Wall edition is designed for 4-screen video walls and you can display the same or different content across the video wall or on individual screens. Repeat Signage licence is per PC playing presentations and is a one-off fee unless you decide to upgrade. Both editions allow scheduling and remote updating from anywhere in the world. RepeatServer.com is a free service that allows you to create and host RSS feeds online, and update your content remotely from anywhere in the world, free of charge. Our news feeds can support Chinese, Japanese, Russian, Greek and other characters.